Having nature's little helpers to assist with your tank maintenance has its benefits. In Part 1 of this series we profiled hermit crabs and snails that are best suited for reef tanks, and in this article we will be discussing various shrimp, true crab, and sea urchin species as reef tank janitors. 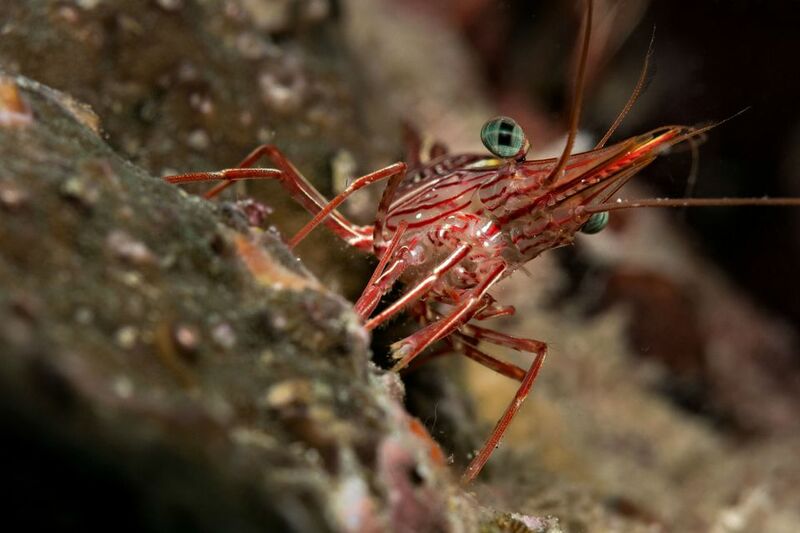 Shrimp are not algae eaters, but natural scavengers. For this reason, they make good tank cleaners. They are best kept singly or as a mated pair. Some species will pick at other invertebrates and soft corals, and some larger species may attack fish, so be careful about which type you put in your tank. Most sought after are Cleaner Shrimps of the Lysmata species, particularly the Pacific Cleaner Shrimp (Lysmata amboinensis) and the Scarlet Cleaner Shrimp (Lysmata debenius), also known as a Red or Fire Shrimp. These little shrimp not only help to keep the tank cleaned as good scavengers but also are fish parasite pickers that are used in reef tanks for controlling saltwater ich. The Coral Banded Shrimp (Stenopsus hispidus), also known as Banded Coral or Boxer Shrimp, is very popular. Aside from being excellent scavengers, they are pleasant to look at, with their red and white stripes, and are considered reef safe. Some aquarists express concerns about this shrimp because some say they've seen them attack fish. From our experience with keeping many of these shrimp over the years, both in fish-only and semi-reef tanks, we have never had this occur. Coral Banded Shrimp are territorial and will "chase off" fish, but we have never seen one attack, catch, or kill a fish. In fact, often they take up the task of cleaning fish and even a Snowflake Eel, much like the Cleaner Shrimp does. This shrimp should only be kept singly or as a mated pair, because both males and females will fight each other, most often resulting in the death of one of them. The Clown or Harlequin Shrimp's (Hymenocera picta) diet consists solely of the tube feet of Echinoderms in the Starfish Family. In Hawaiian waters we know that when you find a Harlequin Shrimp the small Linkia species of Comet or Blood Spotted Starfish will be close by because this is its primary food source. It truly is one of the most stunning and colorful Shrimps, but it rarely accepts other aquarium foods. Unless you have a good supply of starfishes for this shrimp to live on, it does not do well in captivity. If you have some prized starfishes in your tank, it is not wise to keep a Harlequin with them. The "true" Peppermint Shrimp (Lysmata wurdemann), not to be mistaken for the Camel, Camelback, or Humpback Shrimp (Rhynchocinetes uritai), is a top reef tank janitor choice for controlling Aiptasia sp. anemones, and is another excellent scavenger. Even though the R. uritai is also a good tank cleaner, it is known for its fondness of Corallimorphs (Mushrooms) and Zoanthids, so this should be considered if you have these types of soft coral species in your tank. The Anemone or Pacific Clown Shrimp (Periclimenes Brevicarpalis) is a small shrimp of only one inch in size that has a symbiotic relationship with Sea Anemones and Clownfishes. This shrimp is said to be a reef safe tank cleaner that lives in a host anemone's stinging tentacles, feeding or scavenging on food scraps along with the Clownfishes. When it comes to picking out true crabs for your tank, be sure of what you are getting. Even though great scavengers, many species will attack and eat other crustaceans, as well as invertebrates. Species that grow large may attack fish, and they can be rather destructive in an aquarium, much like the 7-11 Crab for example. You want to choose crabs that remain small and have very little, if any, negative impact on other marine life. The Emerald Green Crab (Mithrax sculptus) lives among rocks and feeds on algae, especially filamentous and Valonia (Bubble) types. This crab only grows to about one inch in size and is touted as one of the best reef safe crabs to have for chowing down on algae. Another good herbivorous species is the Sally Lightfoot Crab. The "true" Sally Lightfoot species is the Grapsus grapsus found in the Galapagos Islands, which most likely won't be the one you find in fish stores. The Percnon gibbesi, found in the Caribbean and other tropical waters around the world, is also labeled a Sally Lightfoot and often referred to as a Nibble Spray Crab. This crab is said to be very shy and may hide for quite some time in your tank, only being seen on occasion until it becomes familiar with its environment. A strange looking species is the Arrow Crab (Stenorhynchus Seticornis). This crab is a good scavenger but is said to be notorious for pulling Feather Duster Worms out of their tubes and may pick at other invertebrates -- not a species considered completely reef safe. Not really crabs at all, but distantly related to scorpions, ticks, and land spiders, Horseshoe Crabs have their own classification, Class Merostomata, in the Phylum Arthropoda. The most common species are Limulus polyphemus, found along the Atlantic and Gulf coasts of the U.S., and three species of the genera Tachypleus and Carcinoscorpio, found in southern and eastern Asian waters, from Japan to Indonesia and India. They feed on worms, mollusks and other small invertebrates buried in sand or mud; these animals mostly come out during low light or nighttime hours to scavenge. Unfortunately, even though excellent sand sifters and scavengers, they can grow to three feet in size, which makes them rather destructive little bulldozers, and they are carnivorous. For these reasons, these animals are not considered to be reef safe. However, IF provided an appropriate environment, and you have a tank big enough to keep one, because it spends most of its time burrowing into the substrate, it makes an excellent sand stirrer. Sea urchins are used as indicator organisms in public aquariums to determine if the system is functioning properly? Because these animals are so "picky" about water quality and cleanliness in an aquarium, they are the first to show signs of stress, seen when their spines are laying down or falling off. There are numerous varieties found in both tropical and colder water oceans around the world? Urchins are generally referred to as Wana (sounds like vawna) in Hawai'i? It is not unusual for some urchins to house tiny, species-associated shrimps within their spines? Triggerfishes and Puffers will pick the spines from sea urchins, turn them over, then break open their shells to eat them? Prior to the early 1970s, sea urchins in California were considered nothing more than pests, but now the export value of California's sea urchin fishery is a multi-million dollar industry? Many species enjoy eating coralline algae? This is not necessarily bad unless you place too many in number or of large size in a tank where their appetite can exceed the amount of coralline growth available for them to feed on. If this is a concern, you might think about placing a few urchins, such as Variegated Urchins (Lytechinus variegatus), in the sump to help remove excess coralline, micro and macro algae growth there. Some species are particularly predatory, and many do not eat algae at all? Long-spined members of the Family Diadematidae, such as Diadema and Echinothrix species, have venomous stinging spines? Large growing species can be cumbersome and act like little bulldozers, causing damage and the rearrangement or destabilization of rock and coral scapes? Now, with so many similar or closely related species found worldwide, urchins can be difficult to identify, and even though a lot of these animals can be algae eating machines, as you can see some do not have positive traits. The bottom line about picking out sea urchins is to be careful of what kind you are really getting. Being too large in number to try and cover all the varieties here, we are going to profile some of the more common species. These urchins are so named for the pencil shape of their spines. Some Pencil species, such as the Caribbean species Eucidaris tribuloides, are meat-eating animals, says Ronald Shimek in his article, There's No Reason To Be Spineless. He states that, "Before I found this out in my own system, I watched a Pencil Urchin (Eucidaris tribuloides) catch and eat a scarlet cleaner shrimp". A member of the Family Echinomertridae, the Hawaiian Pencil Slate or Slate Pencil Urchin (Heterocentrotus mammillatus) is one of our favorites because of its beautiful smooth, blunt ended, brightly red colored spines. Whether or not this species is completely reef safe is questionable, but we know that it is not an easy urchin to care for, not living long in captivity unless a plentiful supply of algae is provided. Members of the Family Cidaridae are often referred to as Pencil Urchins, but these species have blunt, well-spaced primary spines, ringed at the base by smaller secondary spines, and the primary spines are often covered with algae and detritus. The Hawaiian Rough-Spined Urchin (Chondrocidaris gigantea) grows quite large, to four inches in diameter with six inch long spines, while the Ten-Lined or Sputnik Urchin (Eucidaris metularia) grows to a diameter of four to five inches and the Thomas's Urchin (Actinocidaris thomasi) to only about one inch. These urchins get their name from the trait they have of picking up and "collecting" objects, such as leaves, small rocks or pebbles, coral rubble, plant matter, and just about anything else they can find to camouflage themselves with. They come in an array of colors from light pastels to black. The Black Collector Urchin (Tripneustes gratilla) is commonly seen in Hawai'i. It spends its time on the reef slowing cruising around rocks and corals searching for algae to eat and grows to about five inches in size. This urchin will cruise around on the glass and roam the aquarium in search of algae to eat. Mentioned earlier, the Variegated Urchin (Lytechinus variegatus) is yet another type of collector urchin. Once again referring to Ronald Shimek's There's No Reason To Be Spineless article, Shimek states that one of his personal favorites is the Blue Tuxedo or Royal Urchin (Mespilia globulus) found in Palau that seldom exceeds 3 cm in skeletal diameter. It is an excellent herbivore, small, and does not disturb other corals or other inhabitants. It likes to cruise the rock work, eating microalgae and some coralline. Besides, with its beautiful royal blue color, it's quite an eye-catching urchin. Named so for boring into solid rock, usually limestone or tufa, these urchins continually scrape with their short spines and so-called teeth to accomplish this. These urchins pretty much stay out of sight, and if no rock is available for them to bore into they will burrow into the substrate, wedge down inside or between coral branches, or crawl under or into any space they can find to hide in. The Pale Rock Boring Urchin (Echinometra mathaei) is the most common species found in Hawaiian waters, and possibility the Indo-Pacific. Most shallow reef flats in Hawaii are riddled with channels and holes bored by these animals, but they can be found at depths to 50 or 60 feet wedged under branches of Finger Coral. It only grows to a size of about two inches and is typically light greenish-white to gray, reddish-brown, or purple in color. From our experiences with keeping these urchins, they pay very little or no attention to algae. The Oblong Urchin (Echinometra oblonga) is closely related to E. mathaei, and, apart from its dull black color and slightly more oblong shape, the physical differences between these two species are slight. They occur in the same shallow reef flat habitat, but the Oblong Urchin is usually restricted to depths of less than about 10 feet, preferring the shallow rocky shores that are exposed to constant wave action. The Rock Boring Urchin (Echinometra lucunter) might be considered the Caribbean and Gulf of Mexico version of E. mathaei found in Hawaii. Some common species that inhabit colder water regions are the Red (Strongylocentrous franciscanus) and the Purple (S. purpuratus) sea urchins, which are found along the North America coast from Baja, California to Alaska. The Green (S. droebachiensis) species is found in the eastern Pacific as far north as Point Barrow, Alaska, and southward to Washington. It occurs in the Aleutian Islands and westward to Kamchatka, Korea, and Hokkaido, Japan. In the North Atlantic, it is found on the East Coast of the U.S. and Canada and in Greenland, Iceland, and northern Europeals. What Are Triggerfishes and How to Identify One? How Well Does a 7-11 Crab Keep in an Aquarium?